1) Editors weren't used to the idea of books crossing over. For whatever reason, the Doom Patrol wouldn't end up guest-staring in the Justice League of America until 2004. 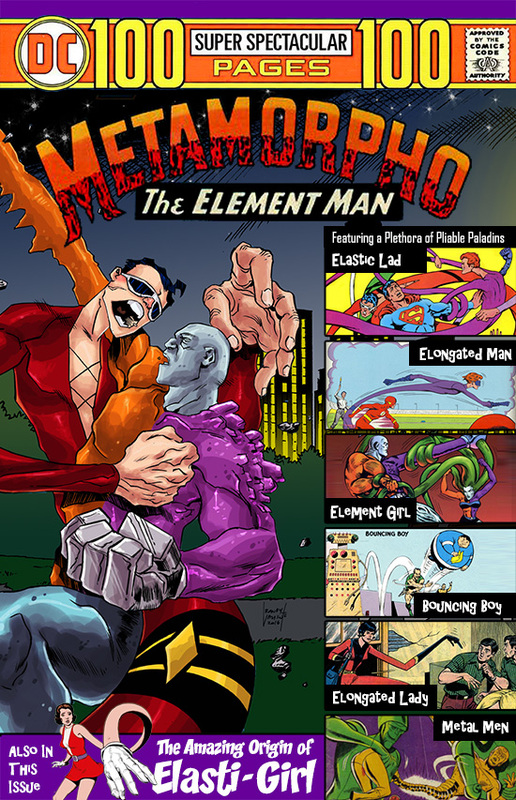 This was a lead in that introduced the team to a new generation of readers. 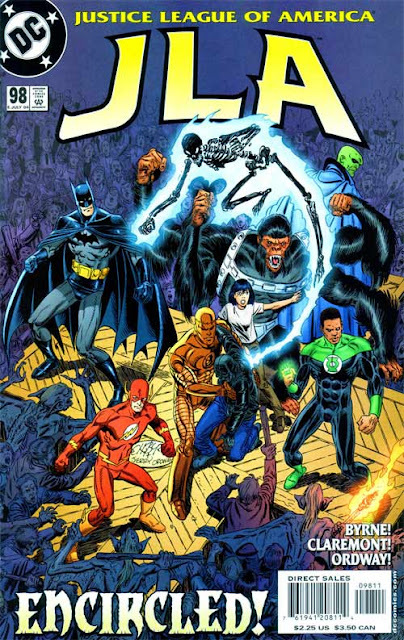 In a perfect world, it would have given John Byrne a perfect kickoff for his take on the team. Unfortunately, Byrne's take on the team just didn't click with readers at the time and the book was cancelled by issue 18. 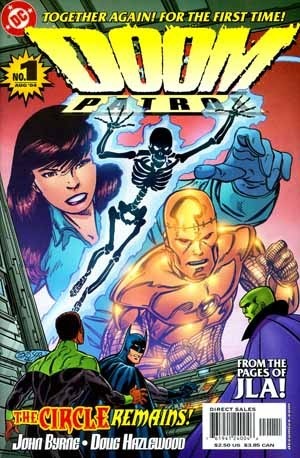 Doom Patrol is a group that you can use to tell stories that might seem out of place in your typical superhero comic. I think that's a core trait to the team that has survived even into this jaded age. This weekend, I was at HeroesCon 2016 where I got to meet Neal Adams who kindly signed my Deadman hardcover. 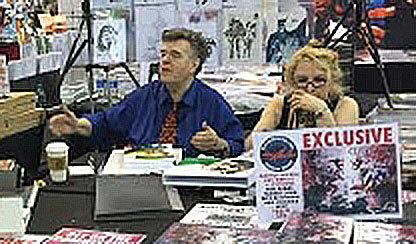 I took this opportunity to ask him about a remark another guest (the incredible Ramona Fradon ) had made about how Neal had improved DC's colors in their comics. Neal told a wonderful story about the early days of comic production that I will condense and illustrate for you today. Why the lightest shade of each color was designated with a 2 rather than a 3 is beyond me, but that appears to be how it was done. 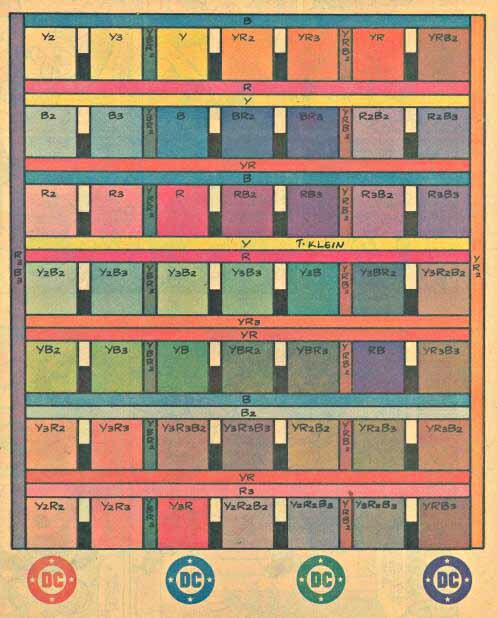 While this doesn't seem like a lot of colors, when you combine them in various ways (like using R2 with Y1) you get a range of 64 colors as this chart which I got from Todd Klein's site demonstrates. With me so far? Good. Because here's where it gets crazy. DC was not using all 9 of the base colors. 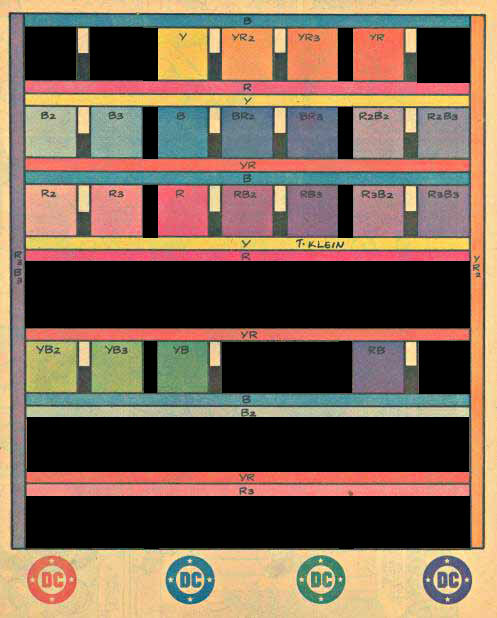 This caused them to only have access to 32 of the 64 colors. 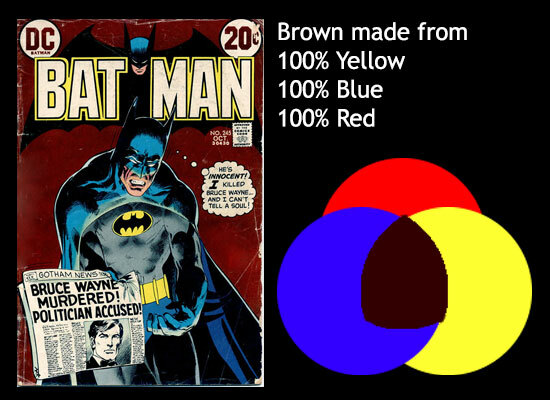 Here's an version of Todd's chart showing which colors DC was able to print. Because of this limited selection, you'll notice (among other things) that the skin tones in Marvel comics look better than they do in DC books during the 60's. 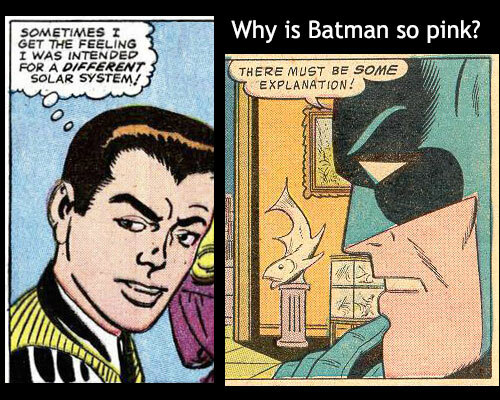 The reason is this: DC was using TWO antiquated rules from the 40's to color comics in the 60's when printing press improvements had rendered those rules unnecessary. First: DC was not using Y2 and Y3. And while it might not seem like a big deal, removing 50% Yellow and 25% Yellow cut their color palette down quite a bit. (Look at the chart above and see all the places where Y2 and Y3 appear.) 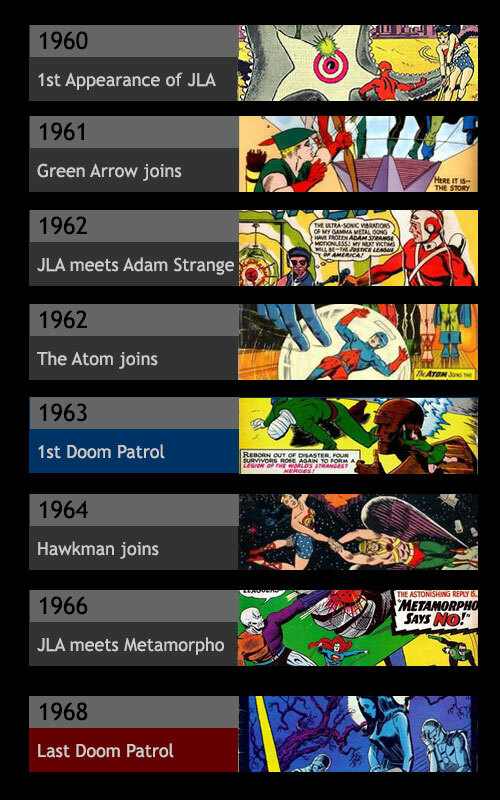 Now, the repetitive nature of the Legion of Superheroes costumes starts to make sense, aye? The explanation for *why* DC was not using Y2 and Y3 seems to be lost to the ages, but there is a suggestion that it was an accounting decision made some time in the 40's or 50's that was never revisited. 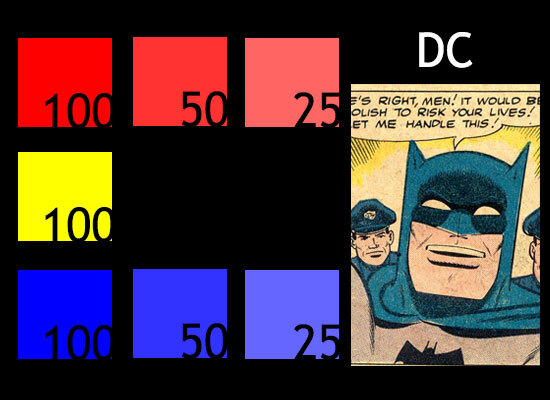 Second: DC was not using any combination of colors that totaled more than 200%. How Neal did this was through some skilled office politics involving the then current Production Designer Sol Harrison, Carmine Infantino, Joe Kubert and Jack Leibowitz wherein Neal convinces them Marvel is getting a better deal than DC. 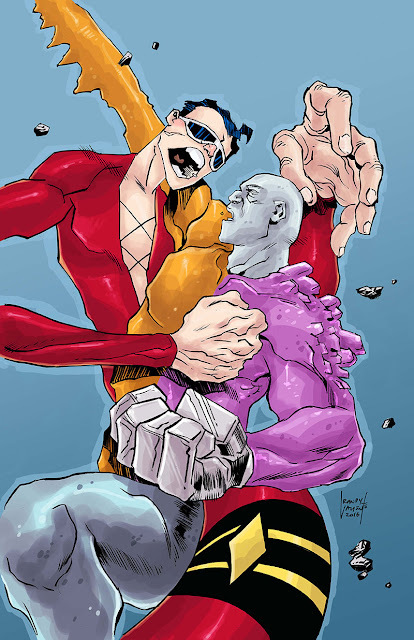 He then used that as the fulcrum to get DC to revoke its antiquated coloring rules. That part of the story isn't something I can really illustrate, but if you are interested in the full details, you can read a transcript from an interview with Dave Sim here. I gotta say, if you ever get the chance to see Neal Adams in person, get him to tell this story. 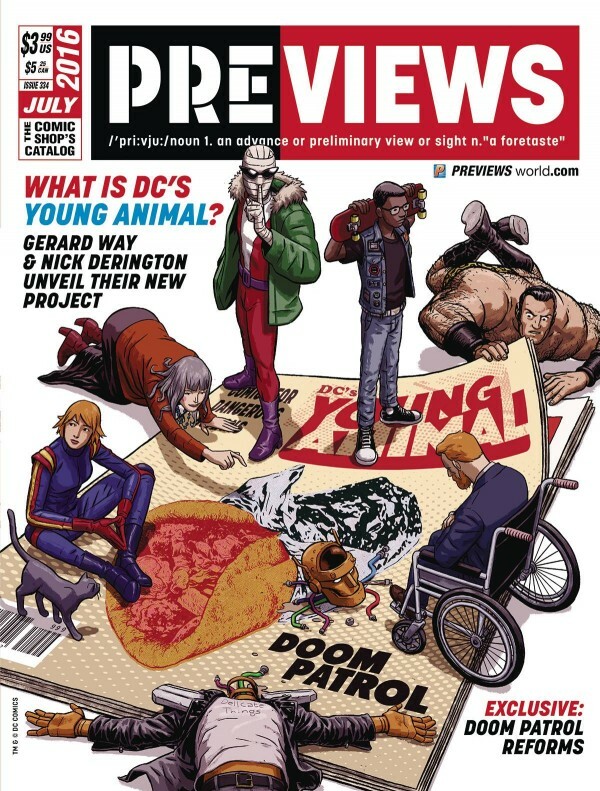 His version is a rousing, pejorative laced tale which will keep you glued as he describes some of the people working at DC at the time, often supplying voices. It was easily my favorite FAN moment of the con! btw - we got a lot of cool photos from HeroesCon which you can check out on our NorthStars facebook group. Before we get to this weeks Lost 100 Pager, I have a public service announcement. 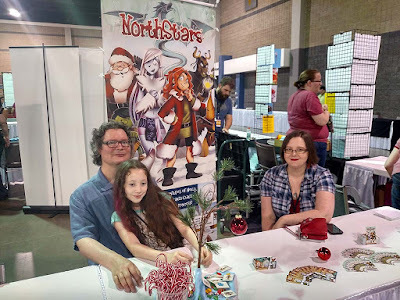 Next weekend I will be at HeroesCon promoting NorthStars. Feel free to come by and say Hi! I will be in booth 423. 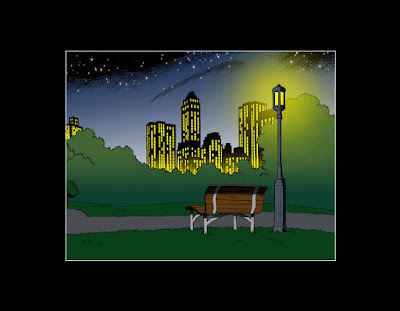 I added a background to break up the colors by using an old page of the Saturn Knight comic Pierre and I worked on many years ago. 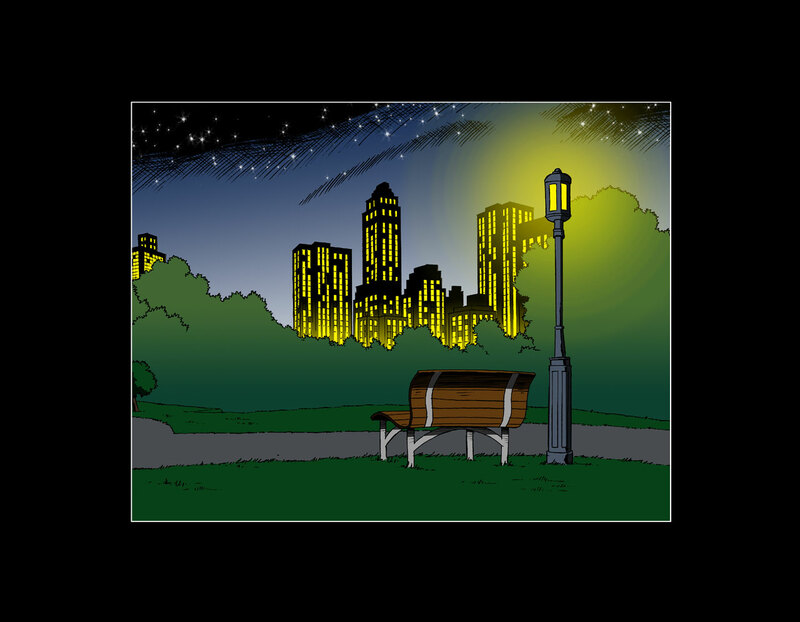 If you haven't read that comic, check it out on our downoads page. 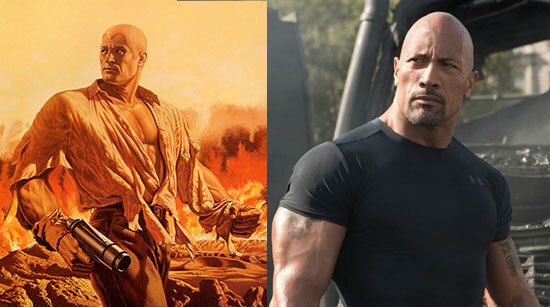 This week it was announced that Dwayne Johnson aka The Rock, is going to star in Shane Black's Doc Savage movie. Most of the reactions I saw to this announcement were positive, like my own. However, as I started thinking about it, a couple of things occurred to me. 1) Johnson's track record is sort of hit and miss isn't it? I mean for every San Andreas, there's a Hercules. 2) Director Shane Black is the guy responsible for Iron Man 3, which I sort of thought was a complete mess. I liked the stuff between Tony Stark and the kid who helped him rebuild his Iron Man suit, but that was really about it. 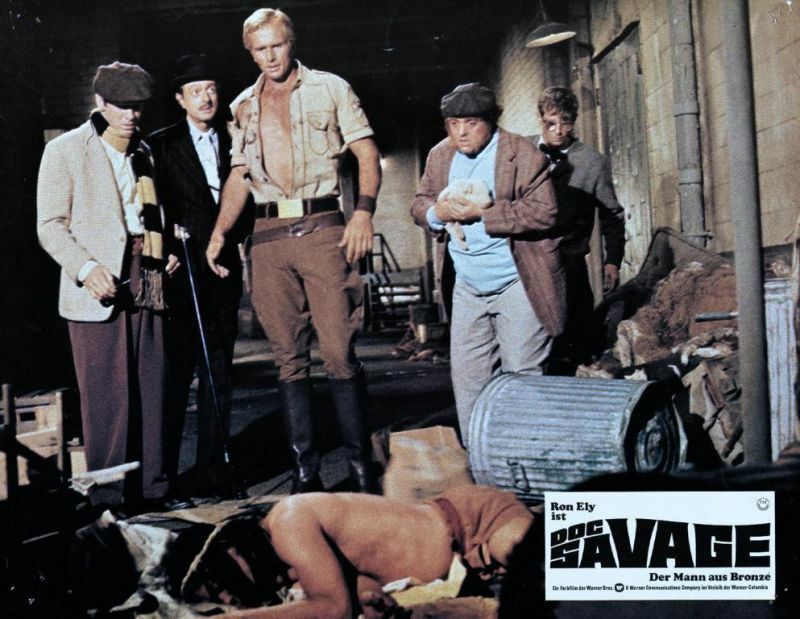 3) Was the old 1970's Doc Savage movie really that bad? I haven't seen it in a long time (I think I was 11 when it came out.) I know it wasn't well received because it was seen as too campy. That's going to be something this movie will have to avoid as well. 4) The script of this movie is going to have to do a LOT of heavy lifting. I think that Doc Savage's name recognition is NOT very high among Mom and Pop America. I would place it somewhere between Solomon Kane and Fu Manchu. So since a lot of people (especially the youngsters who are the primary movie audience) aren't going to know who Doc Savage is, that's gonna mean the trailers will be about 90% responsible for getting people excited about the move. Look for a very Guardians of the Galaxy feeling trailer on this one. 5) Will it be a period piece? I don't think so. I think it will be set in the present day. There *might* be some flashbacks to the 1930's, but that will probably be all we get. Nor do I think we will see the original Fabulous Five in this movie. For one thing, they were all a bunch of white guys, which was fine in the 1930's, but that country club roster won't fly in the 21st century. 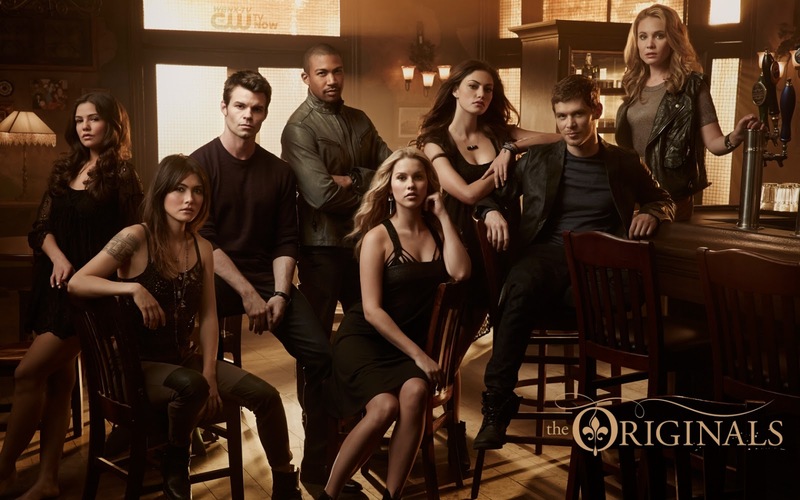 Look for this version's Fabulous Five to be less WW II and more CW crew. With that said, I think you could actually just dump a lot of the original Doc Savage stuff and still have a successful movie. I know. Heresy. But hear me out. In a world where Dwayne Johnson is also set to star in The Janson Directive because the success of the Jason Bourne series has prompted Universal to decide to create a Ludlum Cinematic Universe, I don't think adherence to source material is that necessary. 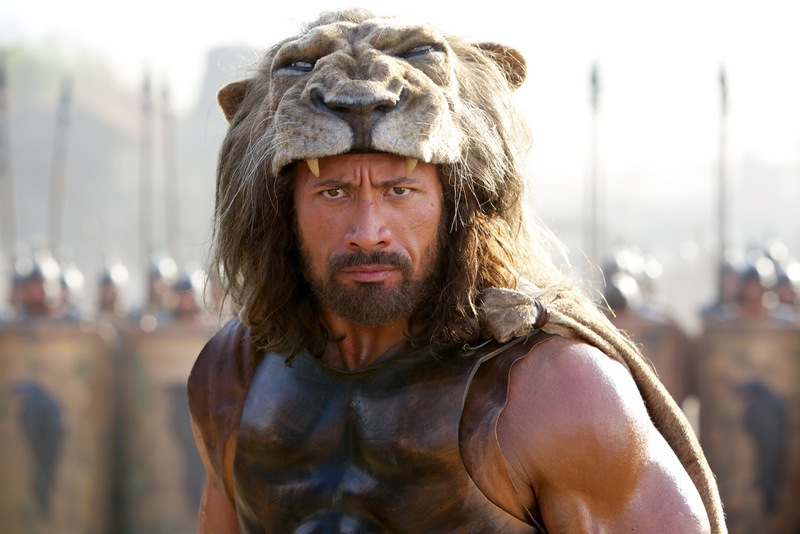 People more or less just want to see a big action movie. And let's be honest, before those Bourne movies, how many people really knew who Jason Bourne was? Also, you look at the BBC's Sherlock series as a good example of a character who was moved successfully into the modern era. So, on paper it sounds like a workable proposition which could turn into a successful movie franchise. Or, it could be a complete disaster.